See the huge range of K'NEX toys available at Ozgem Toys! K'NEX toys help children imagine, build and play! The K'NEX range of building sets has something available for all skill levels and age groups. 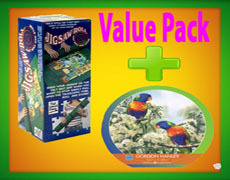 At Ozgem Toys we have a huge range of K'NEX building sets available. The K'NEX range offers sets with various themes and brands such as Mario Kart, Nascar, Top Gear, and Monster Jam. You can build anything from a monster truck to a roller coaster! Discover the K'NEX range today!